Review: The Public / It's Just Movies Review: "The Public"
The Cincinnati Ohio Library is being sued for $750,000 by a frequent patron who was told he must leave the building because of his smell. He claims discrimination. The humble librarian, Stuart Goodson (Emilio Estevez), who was pressured by annoyed patrons to ask the odor-handicapped fellow to leave, is held responsible. Even though it looks like Goodson will be fired, a bigger incident suddenly occurs that assures a greater embarrassment for the library and city government. Coincidentally, during this crisis at the library, the city is experiencing a record cold snap, so an all-male homeless group has decided to occupy the offending librarian’s floor throughout the sub-zero night. Emilio Estevez wrote and directed this startling focus on the failure of government, both local and federal, to address America’s homeless crisis. Det. Bill Ramstead (a complex but macho Alec Baldwin), representing the Cincinnati Police Department, and district attorney Josh Davis (Christian Slater) representing the snide side of city government, are the bad guys. The citizens of Cincinnati (a little wordplay on sin), like citizens throughout America, are sick of its officials doing nothing to solve the homeless situation. The homeless men are simply caught in a struggle to survive. Either the library or jail is better than freezing to death on the streets. It’s the people of the town who rise to counter the sin of the administration, bringing boxes of supplies for the occupiers. The performances of each cast member are outstanding as are the script and direction, both by Estevez. Each character has his own battle and his own Achilles’ heel. In an interview on WGN Chicago, Estevez explains that libraries in cities throughout America have become daytime havens for the homeless. He laments that not only has homelessness become criminalized, librarians have become both social workers and first responders. The casting for “The Public” by Mary Vernieu and Michelle Wade Byrd is superb. 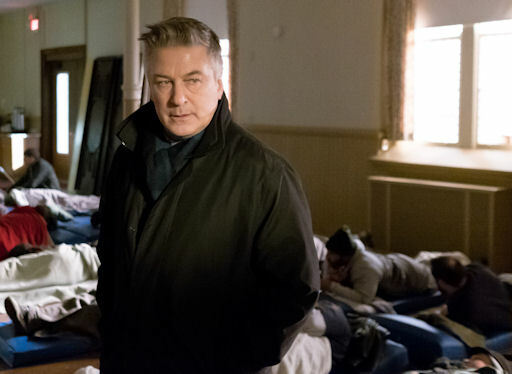 Alec Baldwin plays the police representative with a secret, that his own son is an addict and homeless on this cold night. 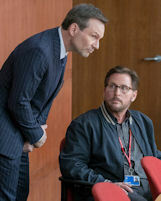 Christian Slater, as the city prosecutor and mayoral hopeful, knows his popularity will be judged on how he handles this situation. Each homeless man has his own distinct challenge. Plus, there is pluck (Jena Malone) and romance (Taylor Schilling) to add some fun and further complexity. Being that “The Public” covers a current crisis in our time, Estevez’s ingenious film is a must-see. “The Public” — which also stars Gabrielle Union, Jacob Vargas, Michael K. Williams and Jeffrey Wright — opens in theaters on April 5, 2019.